thank you BrownEyedGirll for scanning it! i'll start slowly adding some photos to illustrate it, and i hope others will as well. Edited 4 time(s). Last edit at 2005-11-22 09:48 by with sssoul. 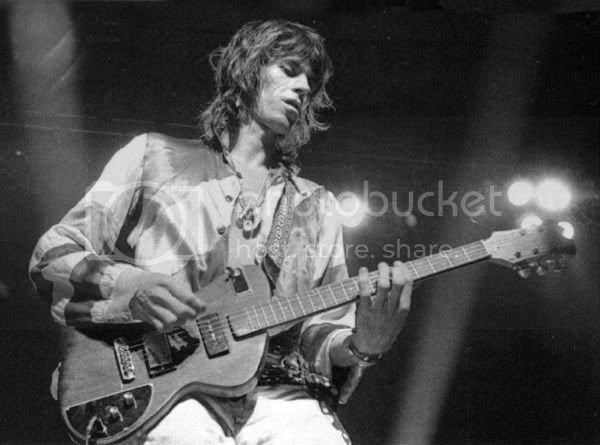 "One six-string is a copy of a Fender Telecaster with Fender Telecaster electronics. I just made it because I had a beautiful piece of mahogany and a beautiful Fender rosewood neck that just seemed to want to be together." 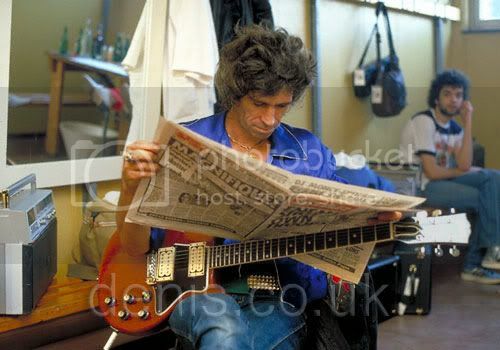 Keith used it in the studio in 77/78 and on the 78 tour, but it hasn't been sighted since then. details/insights more than welcome, please and thank you very kindly! "the padouk and birds-eye-maple five-string that I had just made for the New Barbarians"
[peering hard] ... is this the Newman-Jones job? i guess it's just the lighting that makes the finish look different in the three shots. Edited 4 time(s). Last edit at 2005-11-22 09:52 by with sssoul. 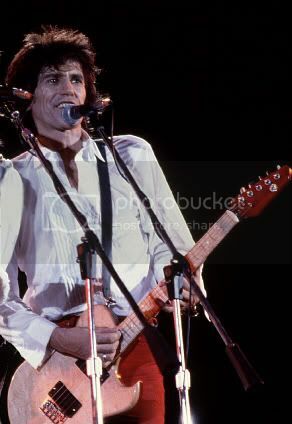 Haha, love those pictures form Knebworth 1979. Cool guitar. And that guitar is decribed in that book I and withsssssoul have. if the threads are good it's because of our gallant, patient and learned Keith Guitar Connoisseurs (thank you!). and: which book do you mean, LA Forum? Edited 1 time(s). Last edit at 2005-10-31 13:33 by with sssoul. Edited 1 time(s). Last edit at 2009-11-08 23:13 by Rockman. 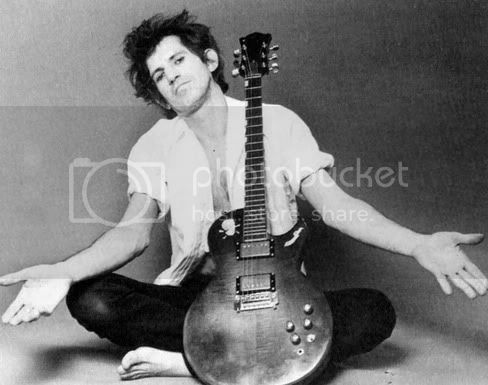 I LOVE it when sssoul starts a thread on Keith because we are always guaranteed some great photos. Most Stones hardcores immediately recognize every photo ans know which tour/concert to place it. So it's always a gas when something brand new comes along. 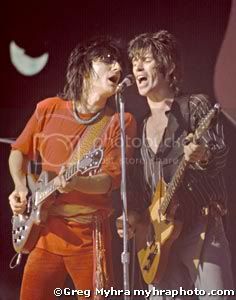 I too had not seen Keith in the 79 Knebworth show. I would have rememeberd that Tux shirt. Thanks sssoul. > and: which book do you mean, LA Forum? > "Music, to me, is the joy, right?" The first twenty years by...NOrman(?) something? A very good book with lots of photographs and detalied map of the guitar Keiths playing in 1979! 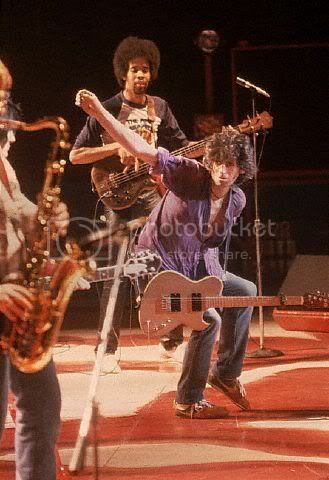 Yep, that's the Newman Jones Telecaster. 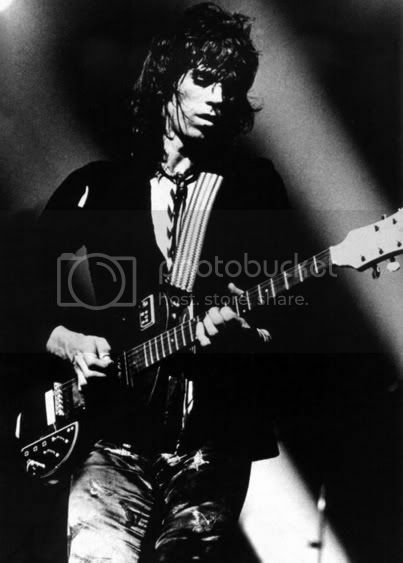 By the way, I did see that Tele once more: at the opening club show of the 1981 tour (what's it called, the Cave or something). 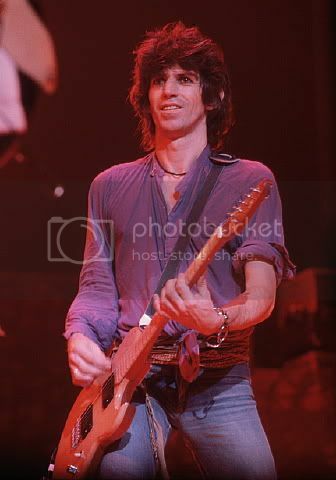 There's for example the Seattle 1981 DVD, and on the back a shot of this club show with Keith playing this Tele is pictured. 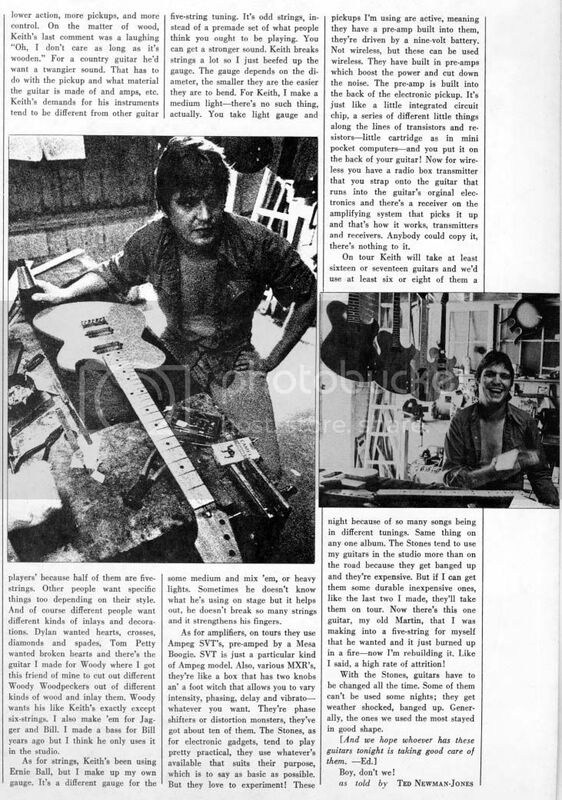 The 1979 pictures indeed show the Newman Jones guitar as blue printed in the book. 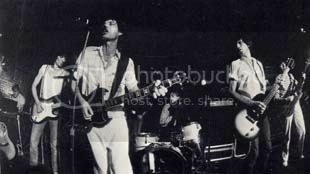 The 1973 pictures also is a Newman Jones guitar, with a PAF at the bridge and a P90 in the neck position. smile: thanks as always, Mathijs! and the Stones were booked as The Cockroaches. Edited 3 time(s). Last edit at 2005-11-08 14:11 by with sssoul. 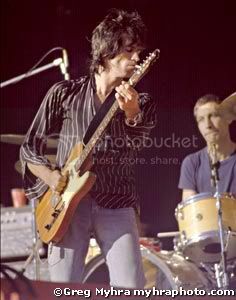 it looks like Keith's got a pre-57 Les Paul Junior. Edited 3 time(s). Last edit at 2005-11-08 14:10 by with sssoul. ... so what have we here - or rather, what has Keith got here? Cool shot! May I ask what book it came from? 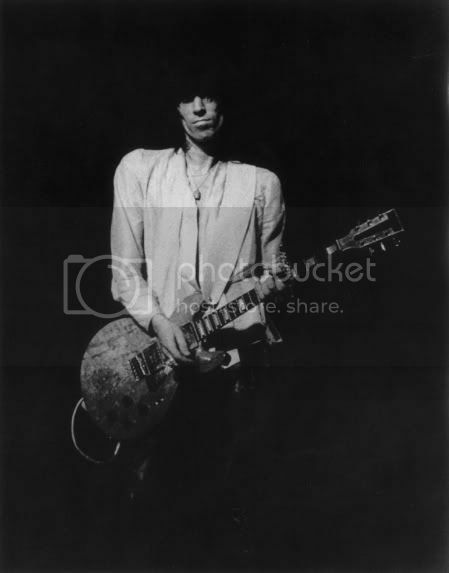 you mean the sepia one of just Keith? i got the upper one from BrownEyedGirll; i'll have to ask her where she found it. the lower one is from Gil Markle's website (i posted the link up there somewhere). Edited 1 time(s). Last edit at 2005-11-01 17:57 by with sssoul. okay, sorry if that 1977 Pay Pack & Follow shot shut everyone up! that guitar has a Newman-Jonesish shape to it, but ... well, moving right along! here are a few more of Keith's custom jobs, starting with a couple made by Doug Young/Doby. "a solidbody double-cutaway with bird's-eye maple body & fingerboard, one-piece maple neck, gold in color, made by Doug Young/Doby Guitars". then there's this "Doby solidbody single-cutaway of curly maple [with] ebony fingerboard, [which] was a gift to Keith & Patti from Doug Young". while i'm at it ... am i losing my marbles, or does that golden double-cutaway buddy resemble this dark-red one? Edited 6 time(s). Last edit at 2005-11-06 21:22 by with sssoul. A wider and longer neck maybe? More frets. 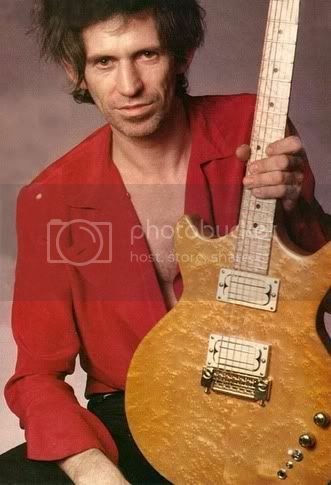 is the gold Doug Young/Doby built to similar specifications as that dark-red LP Special or whatever it is? Edited 2 time(s). Last edit at 2005-11-22 09:49 by with sssoul. Oh withsssoul how I'd love to browse through your Photobucket account. Can't you open it up? smile: i appreciate the appreciation, but it's the commentary from the Esteemed Guitar Experts that makes these threads rock. or as my grandmother taught me: go slow and get 'em all. i will keep sharing stuff, i promise. Edited 1 time(s). Last edit at 2008-02-24 19:40 by with sssoul. posted by with ssoul show them playing Boogies throgh Cerwin-Vega cabinets. 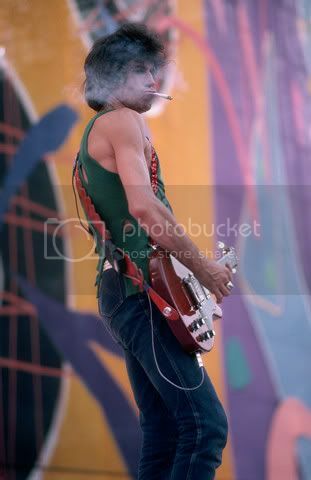 web site has a few photos of them rehearsing with this same setup. 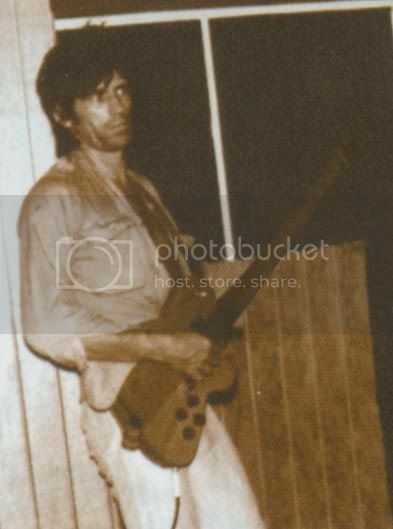 but i just came across one that i find real interesting - i associate that guitar so much with 75/76 that it surprised me to see it in 78.
but maybe it's more likely that it happened in the september 78 fire at the house Keith was renting in LA? Keith's domestic situation is hardly any more secure when the Hollywood house he has been renting in Laurel Canyon burns down. 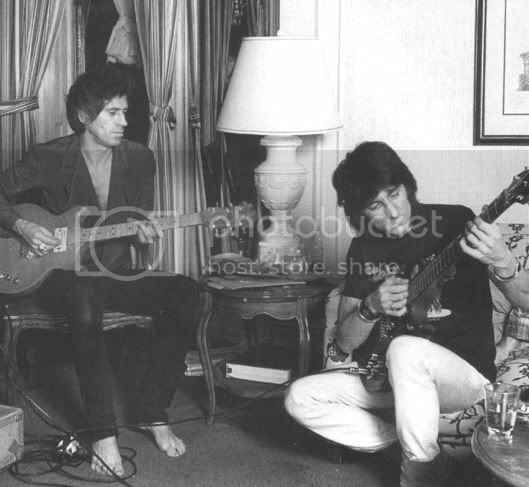 Keith: "I'm in the bedroom with the flavour of the month, my girlfriend of the hour. I wake up and the room's full of smoke. I open the door to the bedroom and I'm looking at a fireball rushing down the corridor towards the oxygen ... and me! good girl, solid gold, saying to me: 'Do something.' And I said: 'What do you want me to do - piss on it?'" otherwise i think i'd have seen more photos of it - so does anyone know what he did use it for then? and/or what really happened to it, and when? Edited 3 time(s). Last edit at 2005-11-22 09:19 by with sssoul. so ... it's a mystery. have some popcorn. Edited 1 time(s). Last edit at 2006-12-19 09:17 by with sssoul. 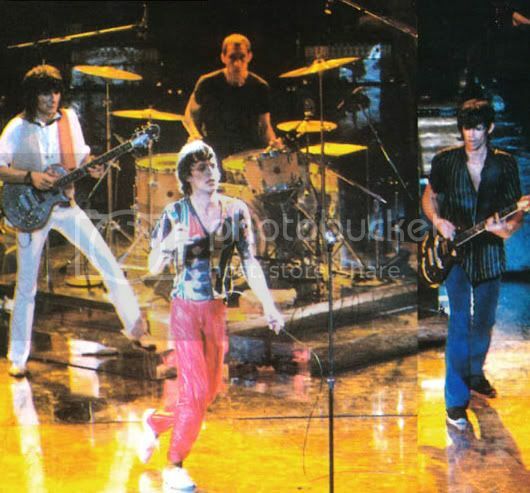 The brown Zemaitis was only used on Brown Sugar for the '78 tour. I remeber him bringing it out at Anaheim for that number only. 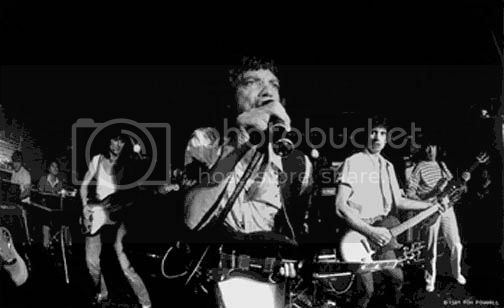 and rehearsals for that tour were done mostly out here in LA, early to mid 1979. I've played a few hand-made Zemaitis guitars, and they're absolutely stunning. Edited 1 time(s). Last edit at 2005-11-09 01:14 by tomk. it sure seems like they live up to their beautiful looks. Edited 1 time(s). Last edit at 2008-02-24 19:42 by with sssoul. 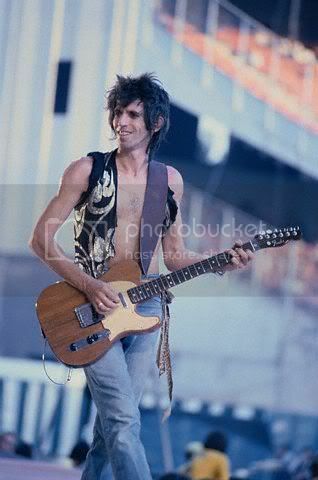 can any of you fine learned patient Keith Guitar Connoisseurs tell us anything about this one, please and thank you very kindly?